Trego focused on the intense battle that ensued when General Sumner’s reinforcements arrived on the battlefield at Fair Oaks, after crossing the rapidly rising Chickahominy River, and attacked the Confederate lines with bayonets. 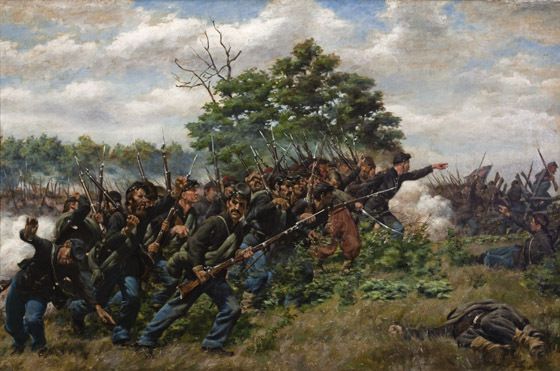 Trego’s painting seems to echo the words of Union commander General McClellan’s 1886 description of the battle: “General Sumner ordered five regiments . . . to advance and charge with the bayonets. . . . Our troops, springing over two fences which were between them and the enemy, rushed upon his lines and drove him in confusion from that part of the field.” (George Brinton McClellan, William Cowper Prime, McClellan’s Own Story: The War for the Union, the Soldiers who Fought It, the Civilians who Directed it and His Relations to it and to Them [C.L. Webster & Company, 1886], pp. 381–82.) Trego apparently knew that a Philadelphia Zouave unit had participated in the battle. However, either he was unaware that their trademark baggy trousers were a shade of blue, and not red, or he ignored this inconvenient fact in the interest of adding more color to the scene. On the left, we see a soldier who has just been shot falling to the ground, while the man in front of him turns to see his comrade go down. Showing a soldier’s awareness that another has been shot was a device that Trego employed with regularity in his Civil War battle scenes. Not only does it call attention to the brutal facts of combat, but it also serves to suggest that the soldiers were constantly aware of the imminent peril they faced and potentially traumatized by the loss of their comrades in arms. The wounded soldier from the 1884 oil sketch also appears in this painting, on the far right side, pleading for help in the midst of battle. There is a face in the background that resembles the artist, though without the mustache he was already sporting. Much of the composition for this work can be seen in another work Trego did in 1895, Union Soldiers in Combat. However, it is possible that the later painting was actually a preparatory sketch for The Battle of Fair Oaks, retouched and redated as a gift to a friend in 1895. Sold by Doyle New York, auction of Modern and Contemporary Art, lot #1309, to the current owner, May 23rd, 2006. New York, autumn 1886: National Academy of Design Exhibition.